Wafa Hourani is a Palestinian artist living and working in Ramallah. 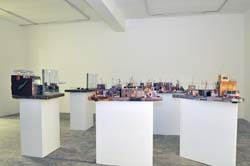 Combining photography and sculpture his Future Cities projects deal with the social, political, and economic realities of Palestinian life to develop grim and apocalyptic predictions for the residents of the West Bank. 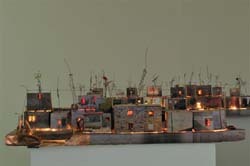 Qalandia 2067 takes its name from the main check point crossing through the West Bank Security Fence which divides the cities of Ramallah and ar-Ram; it is a site of political unrest and human rights concerns. 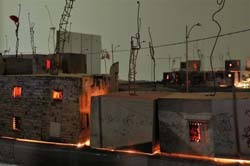 Dating his piece 2067 – one hundred years after the Arab-Israeli 6 Day War – Hourani has constructed 5 scale models envisioning the future of a refugee camp where time seems to have regressed rather than evolved. 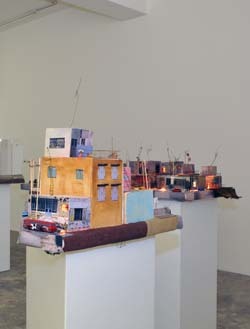 Basing each segment on an actual site – the airport, border crossing, and 3 settlements – the buildings are rendered as war-ravaged and crumbling, crowned by implausibly archaic remnants of TV antennae. 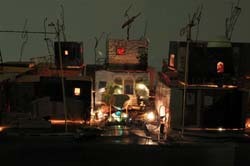 Each building is a miniature light-box illuminating glimpses into the private lives of the residents through film strips placed in the windows, an unnerving reminder that this science fiction horror is, for many, an everyday experience.